Welcome to Lisette, the newest brand of sewing patterns and fabric designed by Liesl + Co. I launched the company’s first brand, Oliver + S, in 2008. During their first year in the market, these sewing patterns for children’s clothing developed a reputation and a following for their contemporary take on timeless classic styles, their clear and detailed sewing instructions, their unique and interesting dressmaking details, and their accurate fit. Since launching Oliver + S, we’ve heard from innumerable enthusiastic seamstresses around the world who love our patterns, and their most frequent request has been, “I want that pattern in my size!” Lisette is our answer to that request. 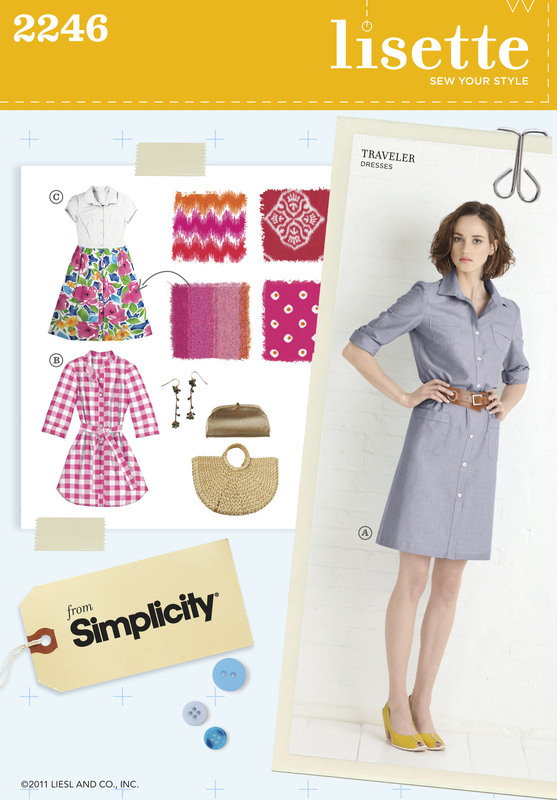 To that end, we’ve partnered with the worldwide powerhouse Simplicity Creative Group to bring you exactly what you’ve been asking for: wearable and appealing contemporary styles for women with clear sewing instructions and a timeless appeal. These are the patterns I hope you’ll return to over and over again. Depending on your choice of fabric, these styles are as appropriate for dressy or business occasions as they are for taking the dog for a walk or the kids to the playground. I hope that you’ll get lots of use out of them and will be inspired to make them in a variety of ways. So where did the name Lisette come from? Lisette was my class name when I started taking French in high school. In some ways I think Lisette is my alter-ego. When I design, I like to tell myself little stories, and the story behind Lisette is that Lisette is an interesting woman who travels the world (while I’m here in New York, working away) gathering inspiration everywhere she goes. She’s sketching and taking photos of everything she sees. Italian millefiori, Moroccan and Turkish tiles, Indian saris, Scandinavian furniture, Persian rugs, and Chinese pottery all catch her eye and inspire her. When she returns home, she takes all the items she’s seen in her travels and filters them through her own imagination to create fabrics and clothing that she incorporates into her life. That idea has inspired me to create this new line of sewing patterns and fabric for you. I hope you’ll find these new products inspiring as well. Congratulation Liesl and Todd,simply breathtaking! Wonderful, Liesl – I am so very, very happy for you. It truly is exciting and joyful to see your creative adventures Blessed over and over and over again. Yes, congratualtions! So so excited – thank you! Congratulations on the launch of the Lisette pattern line. Like Oliver + S, the Lisette patterns are simply elegant. You can be sure I will be placing a pattern order, and awaiting the arrival of your fabric line. I think I’ll start with the passport jacket…. How excititng – something I want to make that I feel like I can. I’m an amatuer sewer but I’m looking forward to trying one of your patterns. They are so me. So Audrey Hephburn in Funny Face. I can just dream of wearing these outfits anywhere around the world. You are an inspiration! Thanks for all your hard work.